Big Cat shows the ropes to his new roommate, Little Cat and they become best friends. After many years together, the Big Cat passes on and after some very lonely days, Little Cat is introduced to a newcomer and takes a new role. A sweet and sad book that can be used to help children understand and talk about loss, whether of a pet or of a beloved elder family member or friend. Not too much is said here in the very simple words and pictures but it's just enough. And so a story of friendship begins, following the two cats through their days, months, and years until one day, the older cat has to go. And he doesn’t come back. This is a poignant story, told in measured text and bold black-and-white illustrations about the act of moving on. Elisha Cooper is the award-winning author of many books for young readers including Train, Farm, Beach, 8: An Animal Alphabet, and Dance!, a New York Times Best Illustrated Book. 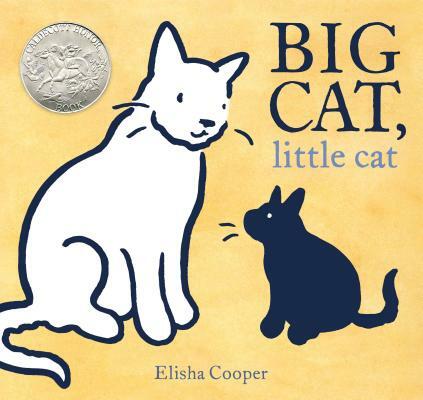 Big Cat, Little Cat is Elisha’s first book with Roaring Brook Press. He lives with his family and two cats in New York City.